Everything else, as they say, is just math. That last variable, however, is one you have a large amount of control over. If you’re only going to be happy driving a Lamborghini while wearing several pounds of gold chain hanging around your neck, then you’ve just made the target very, very difficult to achieve. If, on the other hand, your contentment comes from your relationships, new experiences, exercising creativity or self-improvement, then you can be happier than the Lamborghini driver, in a more sustainable way, without needing a fraction of the wealth (s)he will need. Minimalism means living with less stuff, right? That’s like defining an egg by describing its shell. There’s more to it. Less stuff is just the visible outside of minimalism. At its core it’s not about the amount of stuff you own. It’s about the balance you choose to draw between the focus you have on the world and the extent to which the items, dependencies, inputs and stimuli in your life draw your focus away from an appreciation of your life. If your happiness and security is defined primarily by the things you own, then you are in good company. There’s a reason we refer to the current state of the world as consumer culture. There’s a reason why the vast majority of the cost of a luxury perfume is the marketing and not the product itself. We live in a world of relentless acquisition, focused more on the image a thing projects than on the physical contribution is makes to our lives. Minimalism is a direction we go in to progressively free ourselves of our attachment to material possessions. Note that the possessions are not the problem, it’s our attachment to them. We allow them to define, in many ways, our self-worth. The consequences of this are worry, anxiety, guilt and distraction from the “things that really matter” in life. An excess of possessions, inputs and stimuli overwhelms us and scatters our focus. The consumerist world we live in is designed to accentuate and take advantage of this to encourage us to consume more. Why do you think “new age” movements do so well in our day and age? People are seeking to reconnect with something they can barely remember how to name, let alone define. Meditative retreats, yoga classes, even minimalism itself, are all a form of reaching out for something. For what? It’s difficult to name, for fear of coming across as pretentious, or getting it wrong, or leaving something important out. It’s easier to define it by what it isn’t. It’s not the relentless noise of brands and marketing agencies telling us what to wear, what to eat, how to look, where to go. It’s not the manipulative scream of politics telling us what to believe, who is right, who is wrong, who deserves and who should be excluded. It seeks to avoid the trap of predigested arguments and inherited values. We eat organic because it’s good for the planet? Good for us? A better way to feed the planet? Or because we’re in the first world and can afford to? We drive electric cars because they’re efficient, environmentally friendly or allow us to join a clique? Electric cars in Pennsylvania are powered by coal – think about that for a minute. Don’t get me wrong: I’m all for electric cars and organic food, but do you drive one and/or consume the other for your own reasons or for reasons that have been given to you? Are you sure you can even tell the difference? Almost everything we hear today, if it hits the press, has a lobby group and marketing dollars behind it. To cut through the noise you need to stop listening to everyone else for long enough to hear your own thoughts. What would I like to do over the next three years? Do I like my job enough to do it, or something like it, for the rest of my working life? Am I living in the moment, or am I too distracted to? What could I cut out of my life to reduce distractions and be more in the moment? Would I rather watch TV or spend time with my parents this weekend? There’s a “minimalist movement” out there that feels a lot like a political party. It requires adherence to certain beliefs and protocols to allow an individual to call themselves a minimalist. This typically involves reducing one’s belongings until only 100 are left, eating things that can be cooked in a single saucepan on a single hob and blogging extensively about how it makes you a better person in what appears to be a highly perfected form of the humblebrag. If someone’s telling you what you need to be to join their club, then they’ve become a form of marketing machine themselves, and if it’s minimalism you’re after, they’ve more or less disqualified themselves. The path to minimalism is a journey to a destination you define for yourself. Minimalism is the direction, not the endpoint. I’m no authority on minimalism, although I incorporate, in my own little way, elements of the philosophy into my own decisions. 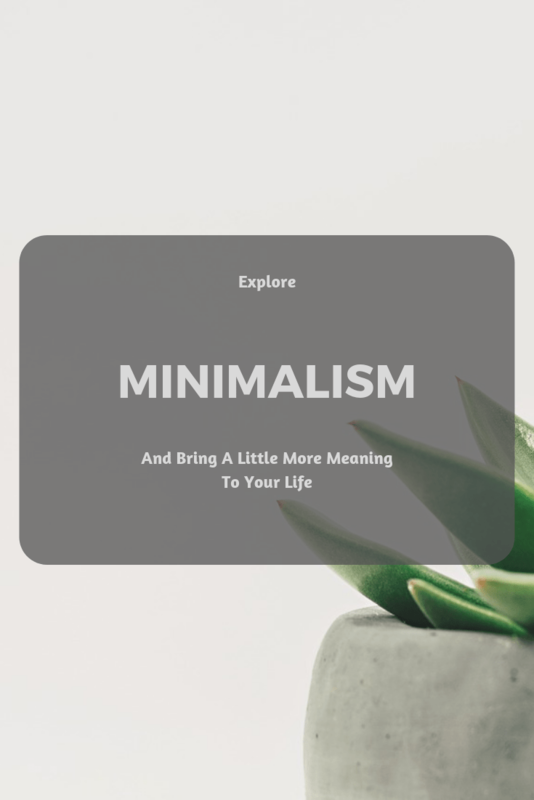 I’m also interested in how minimalism can, if it is attracted to you, enhance your efforts at living a fulfilling life without financial stress. The author of The Life-Changing Magic of Tidying, Marie Knodo is one of the most visible faces of minimalism outside the minimalist movement itself, as she doesn’t really identify herself as a minimalist per se. Her book has been insanely successful and was the first point of contact I had with the entire minimalist concept. Leo Babuta writes this blog from Davis, California, where he lives with a family of 8 total. I have two kids and how having six can be zen is utterly beyond me, but he apparently makes it work and it’s pretty convincing. His blog has over a million readers so you’ll be in good company and it is considered one of the best 25 blogs in the world by Time magazine.